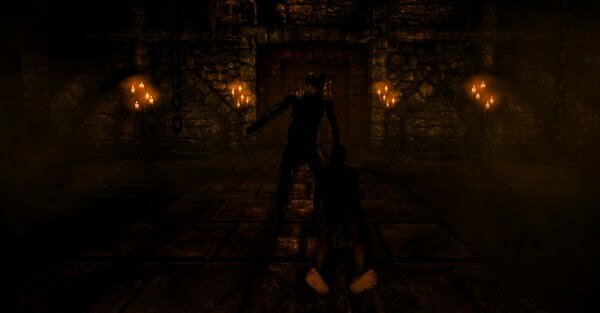 In The Games Of Madness: Amnesia Demo Is Out! The demo is available for Windows, Mac and Linux. Check the site for system requirements and other helpful data. Please help us spread the news, twittering, facebooking, etc! These sites are usually really simple to register at and if enough people vote up, our exposure increase enormously! All help is really appreciated! Thanks for all support so far! Now while you are downloading I would like to discuss some of the thoughts that when into this demo. Creating demos for adventure games is hard, and more so for horror ones, where build-up and foreshadowing is so crucial. In a more action oriented game, the purpose is simply to show of the game's main mechanics (shooting, matching blocks, etc). However, in an adventure game, there is no such mechanic and it is the more holistic parts, like story, mood, etc, that shapes the experience. There are other problems besides showing off the game in the best possible way. It is also important to not have too many spoilers, so when starting the full game the player should not know too much. There is of course also the sale angle, you want people to be eager to buy after playing the demo. It was clear at once that we needed to start from the beginning of the game. The opening is crucial for understanding the game's story and putting the player in the right mood. The problem is that our opening is quite long. Amnesia is not very action filled from the start and slowly builds up the mood. We felt that it needed to be shorter in the demo, so player could get a grasp of the game quicker. To fix this, we remade the first level a bit, so crucial items and information are found a bit earlier. This shortens the experience, but contains the essence. Then it was the problem of what to show next. We wanted the demo to contain creature encounters, but as these are too slowly built up in the full game, they did not fit the demo. So after completing the first level, the player is transported about 2 hours into the game, where more stuff happens. It was then possible to let the demo go on from there and then end with a little cliffhanger. This also worked well from a spoiler viewpoint as the maps are more about atmosphere and most events have already been shown in videos. To further give the demo a good feel of the full game, we made the sanity mechanic be a bit more aggressive. This means that if will be easier to reach an insane state of mind than during normal play. The fear of going insane is a crucial element, so we felt we had to show it off somehow. I think the demo represent the full game fairly well and contains most of its major features. However, it is still in some sense a hacked-up version of the "real thing" and misses a lot of the atmospheric build-up. There is also no time to show of up any of the story either (except for the initial setup), and we only focused on atmosphere for the demo. I guess this is just the way it is with demos and the same really goes for trailers and any sort of promotional material. The good thing is that if you enjoyed the demo you should like the full game even more! Hope you all enjoy this vertical slice of nightmare! Only a few days left until the real beast is unleashed! One thing I noticed in the graphics settings is that the description for Parallax Mapping mentions that setting it high can be quite expensive, but there is only an on/off option. Nothing important but I thought I'd mention it. Also if you could arrange your demo to be available through Steam I'm sure that would greatly increase the amount of people hearing about it. They have all sorts of demos on there. And ... now it is on Steam! Holy crap, the game actually works on my computer? I recently prepared a friend with the idea that I might have to use his computer to play this game, but if the full game has the same requirements as the demo, I may not have to. And it looks really good, even on my PC. I must say, I really liked it. The atmosphere was great, the graphical effects worked well with the perceived insanity (though I must say it was extremely easy to lose it, at least in the demo). Overall, I'm really hyped about the full thing. Can't wait! Yay! That was fun. :) Can't wait 'til the game's out and I get my copy. I do like the voice acting thus far. I dont like the watercolor look that certain parts of the game have. The oil for the lantern needs to last a bit longer. I had trouble with the wheel physics. Apart from that I really enjoyed the demo, it has a very scary feel, will be buying it when it comes out. 2. I loved the visual impact of the sanity level! A much better experience than a health/sanity bar. 1. There's this piece of paper behind glass in the first level.. you can destroy the glass but can not read the paper. Lame. 2. I'm insecure about the sanity 'health'. If it only regenerates from making progress, failing too often could bring you in a situation in which you're bound to die, e.g. you need to cross a dark room, but don't have ways to bring light (lamp empty, no tinderboxes) and your sanity level is very low from walking around in darkness too much. Perhaps I incorrectly remember how to restore sanity. It seems impossible to find the hint about how to restore it again. 3. 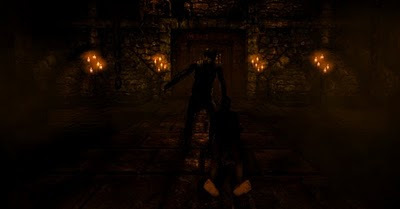 When running through that hallway in which the player falls to the ground, the camera movement can lead to clipping through the wall when you stand next to a wall. Is this intentional? The second way to remove the rope-blocking piece of wood is to throw something at it, right? "The second way to remove the rope-blocking piece of wood is to throw something at it, right?" The whole discussion related to the wood-peace was about people not noticing it at all, so I'm guessing that the alternative solution has nothing to do with that peace - thus "to throw something at it" would be a variation of the first way. 1. Why can't I pick up objects which I can see directly below me? I feel handicapped by not being able to move the camera a little lower and have to step back, then crouch, because I'm too far from the object then stand up again. :)"
In real life, she must be able to extend her arm or something to reach the objects on the floor, all the wile standing straight and tall as ever? Wow! Demo is perfect, I only have one complaint. PLEASE, WHY can't you let me alt+tab out of it? Sometimes it just has to be done. Being unable to move the mouse after alt+tabbing was by far the most infuriating thing in the game for me, and I had to leave the game to do what I wanted in the internet. WHY? Just... good god, please tell me. Also, I've ran the demo several times, and sometimes it runs fine on my 8800gt, e6850 @ 3ghz, 2gb ram, and other times it just... runs at 10fps tops. So I run it once, and "wow this is smooth", close the game, run it again "wow 10fps", close it and then try running it again and then "wow it's smooth again!" So yeah, just saying. It's weird. All with the same settings, nothing was changed. Anyways this is not a complaint, just letting you know I suppose. And yeah I'm the same guy who posted up there! Oh, and just an update, I can't run it anymore. Failed to initialize renderer #0. I am honestly confused, as I said, the settings were not changed at all, so yeah, what the hell right? You know, uh, it either does not run at my default res 1600x900, it only runs at 1024x768, and it runs badly at that. So I get to choose between not running it at 1600x900, or running it badly at 1024x768. First time I ran it, I ran it perfectly at 1600x900 on "High", and now I'm going to try lowering some stuff... I think I'll update if necessary, hope you don't mind the spam lol. The demo is awesome and the game looks GREAT! I have a lot of respect for you guys and I made some advertising on several forums of a french video game site. I hope you'll be able to keep creating video games. Greetings from Switzerland! I hope sales of Amnesia exceeds your expectations, enabling you to continue to do what you hopefully enjoy - and bring diversity to gaming. I just bought the game on Steam and I'm looking forward to playing it. I've started playing (late bloomer, I know!) and I notice a very petty difference between the demo and the full game - I had a (disembodied) hand in the demo, now I have a grey spot. Is that intentional? The grey spot is the cross hair and makes focusing on objects simpler (can be removed in options). The hand should only come up when an object is in focus (under the cross hair), but there are options to change that behavior too. The demo and full game should be identical in this matter though. I have seen a lot of LPs and PTs on youtube of your wonderfully scary game and was just wondering: What's the main difference between the demo and the purchasable version?